DIS is one of the few media companies I truly love watching as an investor. As a traditional media company, they are very progressive. 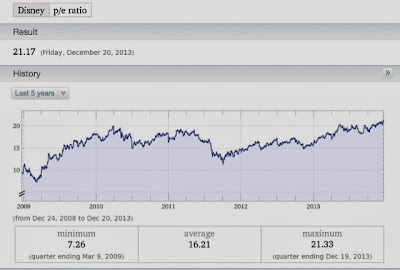 Probably a forced outcome having Steve Jobs as its largest shareholder. They actively push their traditional content through new media distribution mechanisms. With the stock at all times highs, the results are being recognized. Part of the stock move is multiple expansion. Historically DIS sees a high-end trailing multiple around 19-20. Much of that expansion is most-likely from new content opportunities, like mobile games and the new Star Wars movie. Another may very well be how DIS uses social media. (Right now, it seems to be a missed opportunity.) For instance, I follow Darth Vader on twitter, for shits and giggles. (He's pretty funny.) But I noticed a "sponsored" tweet the other day. 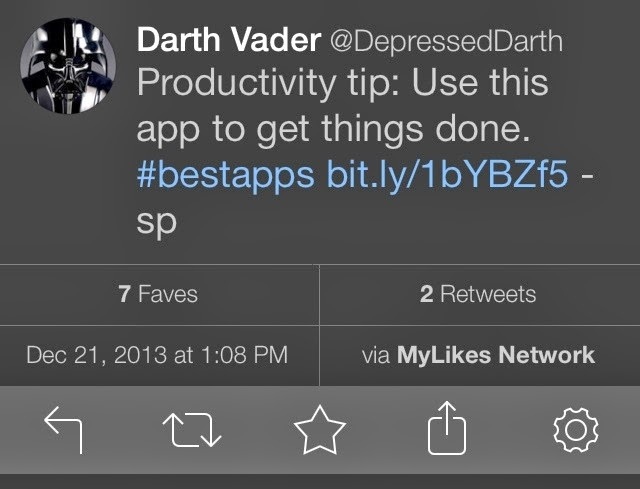 This sponsored tweet is not through twitter, its directly through the Darth Vader account.